YAY! It's officially Fall, the time of harvest. Soon the farmer's markets across the country will be filling up with lots of fresh goodies. There will be pumpkins, fresh fruits and my favorite . . . apples. Close to my home, there is a little town nestled in the North Georgia mountains, called Ellijay, Georgia. This sleepy little town, for most of the year is really a quiet, peaceful place to be. Until Fall, that is. In the Fall, apples are harvested from all of the orchards around this sleepy little town, and the town becomes a busy place. Along with the apple harvest, comes the annual Apple Festival. This is the 37th year for the festival in Ellijay. 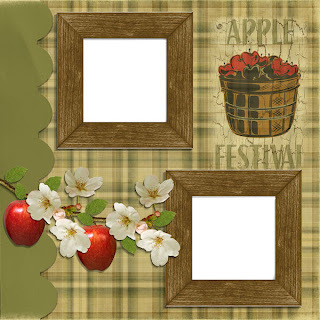 In honor of that occasion, I have created a quick page using Raspberry Road's new kit Apple Festival, you can get the kit on her blog. If you are lucky enough to live where they are having an Apple Festival, why not gather up the family and check it out? You won't be disappointed. I will be visiting Family in Chatsworth and joining the fun of the Apple festival on Saturday the 11th. I plan on getting my fill on apples and other goodies.